Thin foils for the TEM investigations are prepared using spark erosion machine, wire saws, double jet polisher Tenupol made by Struers, and also home made one jet polisher. In case of sampling of non-conductive materials and composites ion polishing system and dimpler is available. 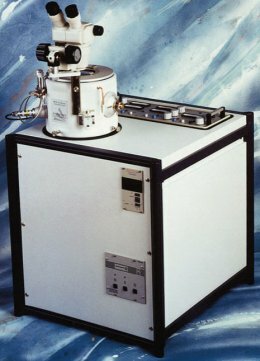 The ion polishing system 691 PIPS made by Gatan is designed to produce high quality TEM specimens having exceptionally large, clean, electron transparent areas. 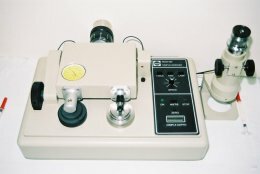 Ion polishing is done by two variable angle, (± 10°), miniature Penning ion guns. Specimen’ contamination is reduced by using an oil free vacuum system consisting of a molecular drag pump with pumping speed for argon of 60 l/s. The single-sided specimen post provides excellent thermal contact with the specimen and prevents specimens from being overheated by the ion beam. The Model 656 Dimple Grinder made by Gatan is a precision instrument used for grinding circular dimples, of spherical or flat-bottomed profile, in the surface of materials such as ceramics, semiconductors and metals. It is possible produce thickness less than 5µm , although in the case of most metals a final thickness between 20µm and 50µmm is more normal since mechanical damage introduced into the specimen surface by the action of grinding must be removed. The grinding wheels are phosphor bronze, available with spherical or flat edges. 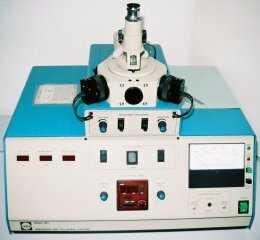 The ion beam thinning unit IV3 F/L made by TECHNOORG LINDA is a unique instrument designed for ion beam thinning of solid samples, especially heterogeneous structures. The gun design provides ion beam thinning rates on difficult materials at low angles. It utilizes a wide range of features, which make it very flexible for specimen preparation. The ion guns are independently adjustable and are capable of thinning angles from 0 to 90º, and can be operated in single sided and double sided thinning configurations as well. A modular high voltage supply provides the gun voltage adjustments from 2-10kV, with other voltage control used for biasing the specimen holder. The specimen holder bias is adjustable from 0-2.5kV, and is commonly used for extremely low angle thinning of composite (high preferential sputtering) or for low angle milling of dimpled specimens. It has the unique capability of utilizing low energy ion gun with gun voltage range 100V-2kV. Several options are also available like specimen cooling using a cold stage, reactive milling with Iodine and slope cutting for SEM cross sections.